Tina Keats is back on the podcast today to give you some great tips on effectively preparing for debates and editorial boards. Even as a candidate running for local office, you should expect to have a debate during your political campaign. We will talk about the difference between the presidential debates and a debate for local office, but how you can still prepare just like a pro! 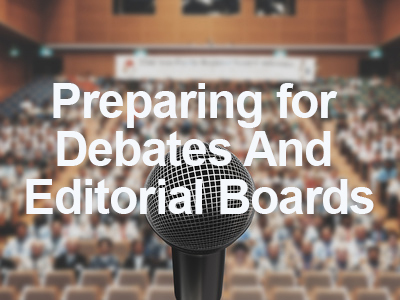 Preparing for debates and editorial boards is another important part of having a successful campaign for local political office. Whether you are thinking about running for school board, city council, or state representative, or helping someone else in their campaign, this podcast has what you need to know to help you prepare! This entry was posted in Podcasts and tagged editorial board, local election, political debates. Bookmark the permalink.